Following a rapid expansion of abnormally dry conditions across the southeast quarter of Colorado in March, moderate drought is now impacting most of Baca County and the southern half of Prowers County. A small sliver of southeast Bent County has also entered moderate drought. Over 28 percent of Colorado is considered abnormally dry - similar to one week ago - however an additional three percent of the state has entered the lowest level of drought, resulting in an overall expansion of the impacted area. Only a few weeks ago, just a small sliver of western Kiowa County fell into the abnormally dry category. By last week, those conditions had expanded to include all of the county and the vast majority of southeast quadrant of the state. 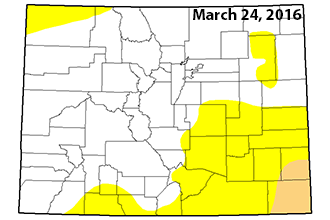 As of last Thursday's report, all of Kiowa, Baca, Bent, Prowers, Kit Carson, Otero, Cowley and Pueblo Counties were considered abnormally dry, as well as most of Las Animas, Huerfano, El Paso, and Lincoln Counties. Fremont and and Elbert Counties are also impacted, along with smaller portions of northeast and northwest Colorado. This week's report adds portions of Costilla, Conejos, Rio Grande, Mineral, Hinsdale and La Platta Counties and all of Archuleta County to the area impacted by abnormally dry conditions. 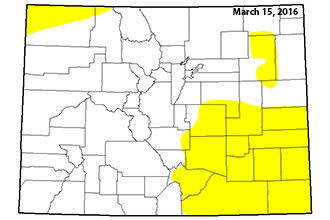 While western and northern Colorado was the beneficiary of rain and snow this week, including blizzard conditions across northeast Colorado Wednesday that brought two inches of water to some areas, southeast Colorado received little to no precipitation and several days of extremely strong, drying winds. Friday night and Saturday offer the best possibility for precipitation in Kiowa County over the next five days, however less than one-half inch of snow is expected.